The community Brenzone sul Garda consists of 16 villages that are spread from the eastern lakeside to the mountain Monte Baldo. All together the region has about 2,500 inhabitants. The most captivating thing in Brenzone is the lovely landscape and the approximately 2,200 meter high Monte Baldo massif. Here you can find peace and concentrate on yourself and the intact nature. 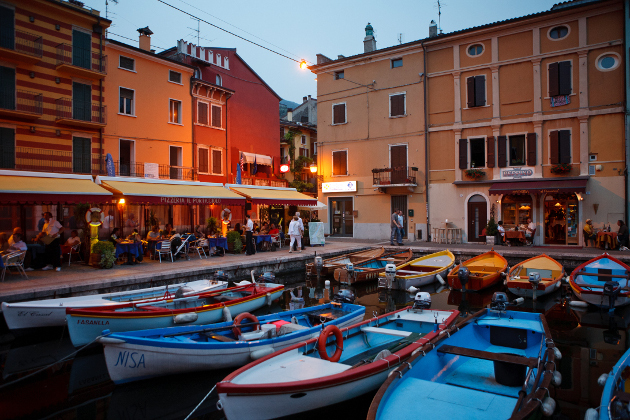 Everyone who is looking for a place to relax at Lake Garda is right at Brenzone. All the small villages are close to the Monte Baldo, which offers numerous possibilities for hiking or exploring the surroundings. The diversity of the landscape is fascinating. You can find alpine and Mediterranean vegetation with olive mills. While hiking through the landscape you discover small towns with historic houses and picaresque old towns. The hiking routs are exhausting but in the end you get the reward with a grandiose view over Lake Garda. The districts Castelletto, Magugnano, Porto and Assenza are located directly at Lake Garda and have a beautiful harbour, spacious seafront with numerous different plants and trees and isolated beaches. The local restaurants offer the famous fish specialities, the Gardaseeaal und die Gardaseesardinen. You could spend hours just admiring the sweeping views across the lake that Residence Castelli offers from its balconies and swimming pool. Choose from self-catering apartments or hotel rooms here.